Anyone who has driven in heavy snow has witnessed an overconfident driver in a 4×4 go whizzing down the icy street only to fishtail or veer off into a ditch. 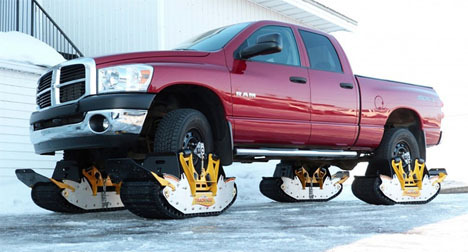 Four wheel drive may not turn vehicles into magical snow beasts that can handle the worst of winter conditions, but these will: the Track N Go system, a series of treads that installs in just fifteen minutes to basically turn an ordinary vehicle into a monster truck. 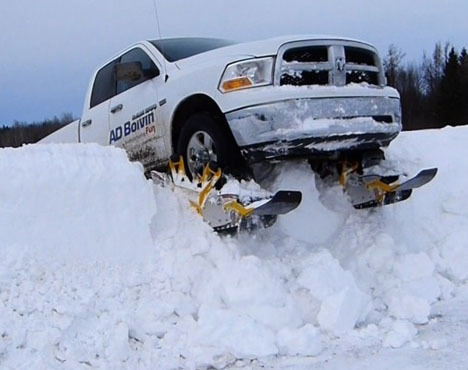 While monster trucks may seem ridiculous when seen on the streets in summertime, watching them tackle four-foot snow banks without a hitch might give some of us a twinge of envy when we’re sliding along at ten miles an hour after the latest blizzard. 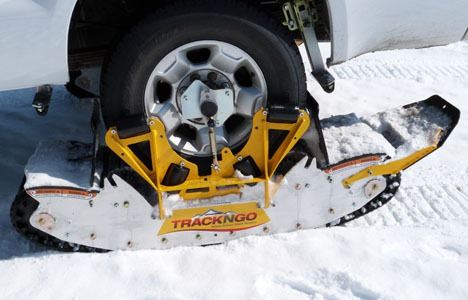 The Track N Go system is a series of four treads that lock onto a vehicle’s wheels to provide traction that tires can’t match. There’s a catch: you can’t exactly install these things on your Toyota Camry. They’re for 4x4s only, and they’ll set you back $25,000. But being that smug driver going where other vehicles can’t, and actually knowing that your car can handle it, might just be priceless. Of course, there have already been some Southerners perking up asking, do they work in mud? 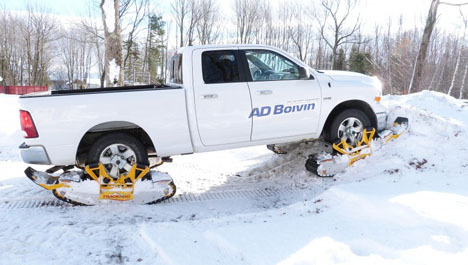 The answer is ‘maybe’ – they were developed specifically for snow, and mud trials haven’t started yet.